See below for submissions related to work health & safety. The Australian Chamber of Commerce and Industry (Australian Chamber) welcomes the opportunity to contribute to the 2018 Review of the model Work Health and Safety (WHS) laws. 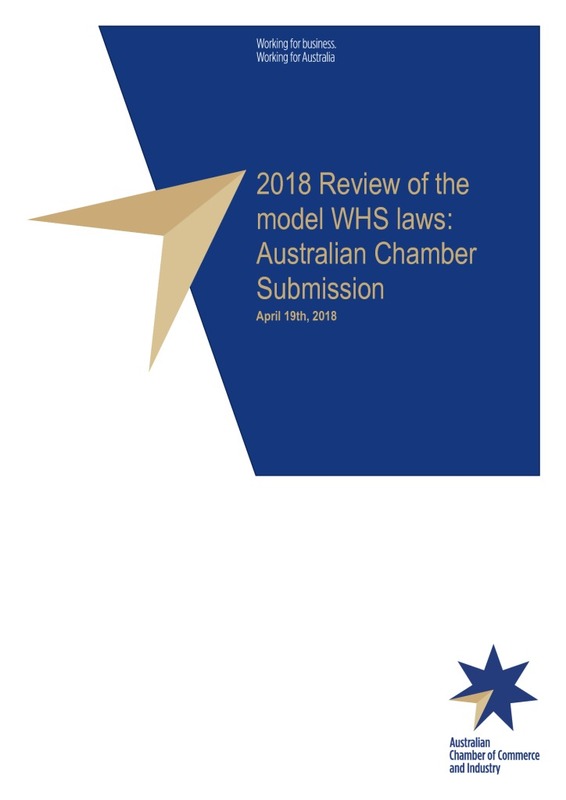 This review is an opportunity to examine the operation and content of the model WHS laws to ensure they are operating as intended in those jurisdictions who have implemented them. The Australian Chamber continues to support the process of harmonisation. Harmonisation was and is widely welcomed. Industry commends the ongoing efforts to eliminate inconsistencies and duplication in WHS legislation across States and Territories but acknowledges more work is still needed. We maintain that the model WHS Act, Regulations and Codes must be focused on safety outcomes and that any legislative tools should be thoroughly justified, practical and nonprescriptive, in line with COAG principles. The Australian Chamber continues to advocate that an effective health and safety culture requires all those involved in the workplace to accept shared responsibilities. Making workplaces safer starts with the workplace culture and attitude, not with regulation. A commitment to preventing and managing risks develops from a foundation of realistic, practical and encouraging guidance suitable for all workplaces. Simple regulation with supportive industry-specific guidance. Development of a tool to assist duty holders in determining which WHS regulations apply to their business or undertaking. Development of guidance on the correct and safe use of expert independent contractors. Regulators assess the impacts of WHS regulation on SMEs and adopt a “light touch /economic nudge” approach. Further research into the management of WHS within SMEs. Clarify and simplify consultation requirements in the Act for duty holders. Ensure external references in the model Codes are easily and freely accessible. Provide education and supporting guidance clarifying workers’ duties and expectations in the context of the changing nature of work. Guidance materials should reflect how inspectors conduct inspections and provide relevant examples of what may be ‘reasonably practicable’ for SMEs.